Looking for a new kind of terrarium to test your skills? I recently built a marimo ball terrarium from EclecticZenMarimo, whose kits are available on Etsy. 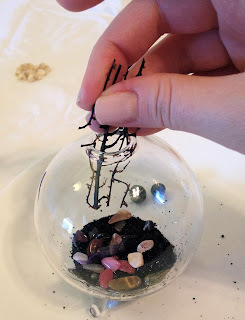 This was an easy terrarium to set up and would make a great gift for someone looking for an unusual aquarium or terrarium for their office or home. UPDATE: Act now and you can enter to win a Marimo terrarium of your own! Just visit EclecticZenMarimo for your chance to win. 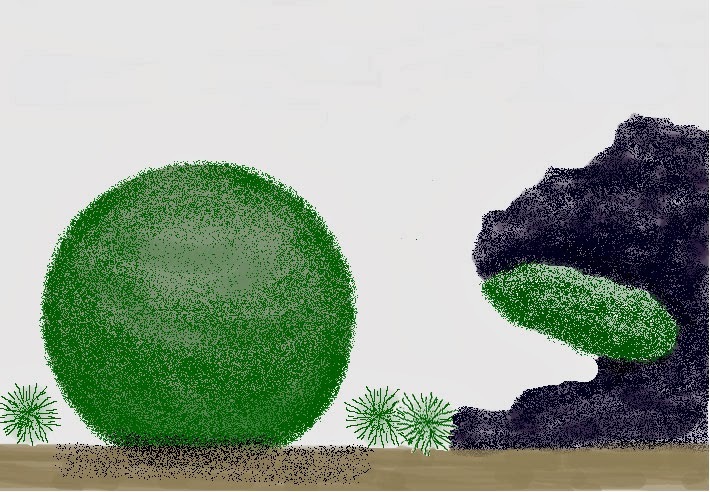 Marimo or marimo moss balls are aquatic, spherical masses of algae that float free in freshwater lakes. Best know for their appearance in Lake Akan, marimo have achieved "national treasure" status in Japan. Observers describe marimo as dancing or moving in aquariums, due to their ability to bob along in still water. Marimo thrive in cold tap water and are thus well suited for a life in a small desktop aquarium. The basic marimo kit from EclecticZenMarimo included gemstones, shells, sand, a spherical bowl with feet, a piece of seaweed, and marimo balls! 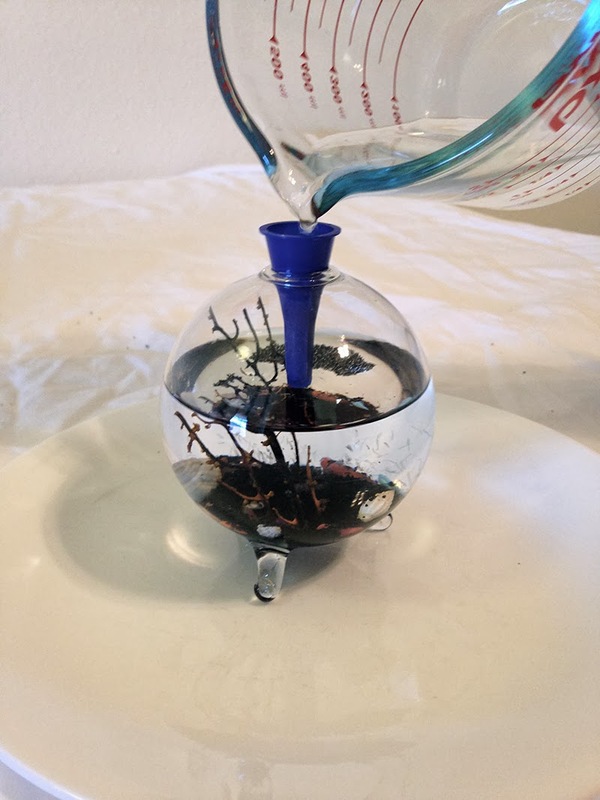 The kit also includes instructions for how to build and maintain your marimo moss ball terrarium, as well as a stick and a small funnel. This tiny funnel came in very handy, as you'll see in a minute. Small funnel, ready for the sand. into the narrow opening of the bowl. After rinsing out the bowl, use the funnel to pour in some sand and stones. I used a piece of paper to funnel the sand into the small plastic funnel provided in the EclecticZenMarimo kit. What if the seaweed is too big to fit? The seaweed is flexible and can be slightly squeezed to position through the hole and into the sand in the bottom of the bowl. What if the sand sticks to the sides of the bowl? Don't worry if some sand sticks to the side of the bowl. Once you pour in the water all the sand will be washed into the bottom of the bowl. Pour cool tap water into the bowl very slowly. Some of your sand and stones may get disrupted - simply use a stick or straw to reposition the items in the bottom of the bowl. I noticed some sand floating at the top of the water after I added it to the bowl. This sand will settle naturally over time, but if you want it looking tidy in a jiffy - I had luck gently tapping the floating sand with the stick. The sand drifted down to the bottom of the bowl. Nothing fancy here- just pop your marimo moss balls into the water. Marimo will need fresh water once a week. I will post again soon with more news about how my marimo balls are adapting to office life! Marimo happy in their new home.